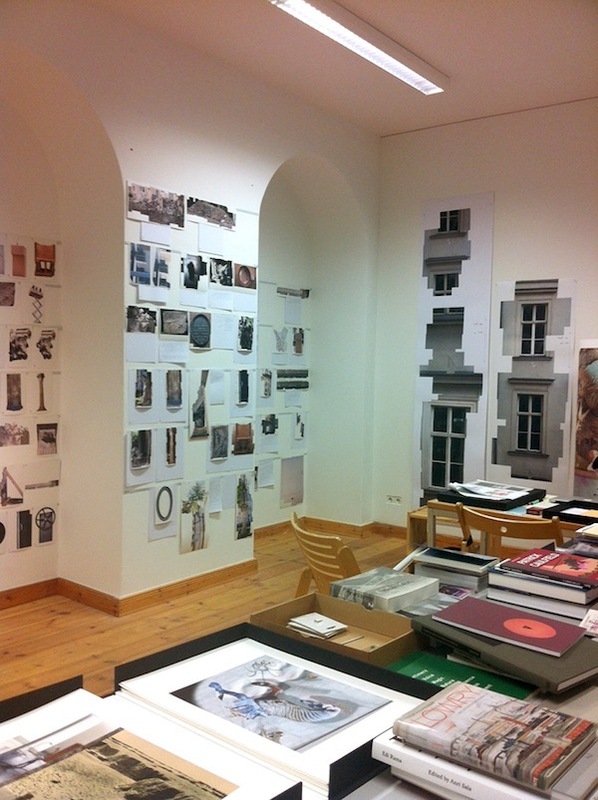 Ilit Azoulay has been in her studio in the inner courtyard of KW Institute for Contemporary Art in Berlin since July. On a rainy grey October day, the studio is warm, the walls covered with inviting images and notes of curious objects she has photographically collected over her stay and travels. If we were in her studio in Tel Aviv, she points out, most of these objects would be physically there, shelved for future reference. Here, the images stand in for the objects – bits and pieces of buildings, building sites, historical and new, precious or worthless relics – which cannot leave their place. Azoulay’s interest, for this project, is not only in the found object but also in each object’s rootedness, its fixity in space and history. Each object is photographed in several shots and then digitally constructed to eliminate perspective and separate it from its environment. All the images on the wall amount to the building blocks of her next, yet undefined piece. Her residency will continue for five more weeks, and she hopes to form enough information and ideas before she leaves to develop this new body of work, though her process, she says, usually takes between a year and two per project. The new project, a result of her time spent in Germany, continues the method she has worked in over the past three years: collecting thousands of images of objects, chosen for their symbolic, aesthetic, emotional or compositional value and arranged in a new, digital tableau, playing with ideas of three-dimensional and experienced space. Walls, buildings and historical objects have always been important for her. In Berlin, she realized, the sentiment, the collective self-perception attached to building styles and materials became even more meaningful, causing her to look back at her work in Israel in another way as well. 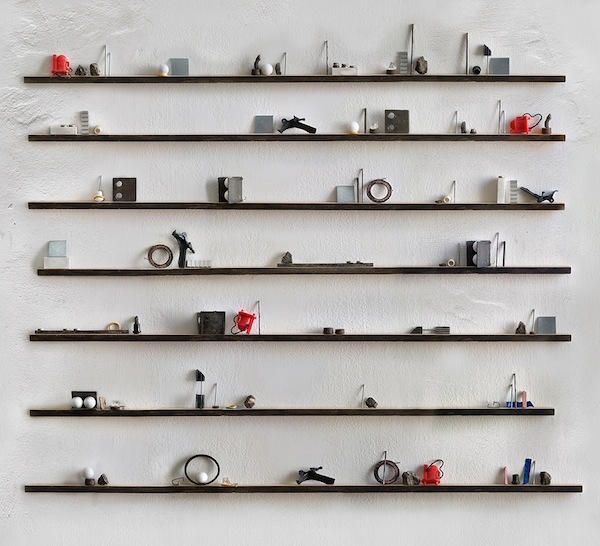 As opposed to the temporary, hasty walls and building methods she uncovered in south Tel Aviv (bits and pieces of which went into constructing “The Keys”, 2010, among others), she was taken by the meticulous documentation, reconstruction and restoration practices common in Germany. Berlin, and some other cities she visited in her travels such as Weimar and Dresden, were demolished in WW2 and reconstructed their historical centers. Towns such as Regensburg and Landshut, which were relatively untouched, are forced under preservation laws to uphold symbols and monuments of anti-Semitism, the third Reich and cold war surveillance, which the residents do not believe in and are even ashamed of. Still other sites, such as the ground under Hitler’s bunker or the piles of rubble that underlie Berlin’s artificial hills, are layered with historical relics that are crushed and rebuilt upon time and again, but still refuse to let go of their physical components. Shards of the historical spaces, including personal items and even office supplies can still to be found under the earth. Systems of memory and preservation – maintained or hidden, making the past ever-present – play a crucial role in Azoulay’s current project. Her process of choosing and collecting specific items of this history is an archeological process of recovering, preserving, but also of assigning symbolic meaning to single images, bringing out their implications for the wider picture. A single shard of porcelain can be a relic, a fetishistic object, a study in who made it, when and for who; but it can also be a piece of beautiful material, separated from its history and admired for its angles, its color and its age. Azoulay’s work holds this double meaning strongly, the appearance of order and beauty on the surface, with a theater of characters, stories and unresolved connections growing more complex the deeper you go into what is behind it. In her studio, books she brought with her are arranged alongside new purchases from Germany and Britain. As her first substantial stay outside of Israel, she says her residency in Berlin has been exciting and inspirational, and has changed her perspective on much of her previously established work and interests. She is interested in spending a longer period in Berlin to finish this project, and can see the appeal it has to many young Israelis, artists in particular. Both Israel and Germany share a complexity of history, and in both places almost anywhere you dig will uncover something possibly historically meaningful. The difference, she estimates, is the educational importance of the past, preserved in Germany for the future whereas in Israel it is often quickly covered up, repainted and rewritten for the next generation. She has also confronted the various receptions her work elicits outside Israel, where its subjects invariably raise more outright political issues than they do in Tel Aviv. She finds this change interesting and is beginning to think of how it is important for her practice. In the end, her works’ multiple layers allow for a superficial or an archeological viewing, and she cannot interfere with the depth and added meanings each viewer might add or come to see in her images. Visit Ilit Azoulay’s website here. Read more posts by Adela Yawitz here.